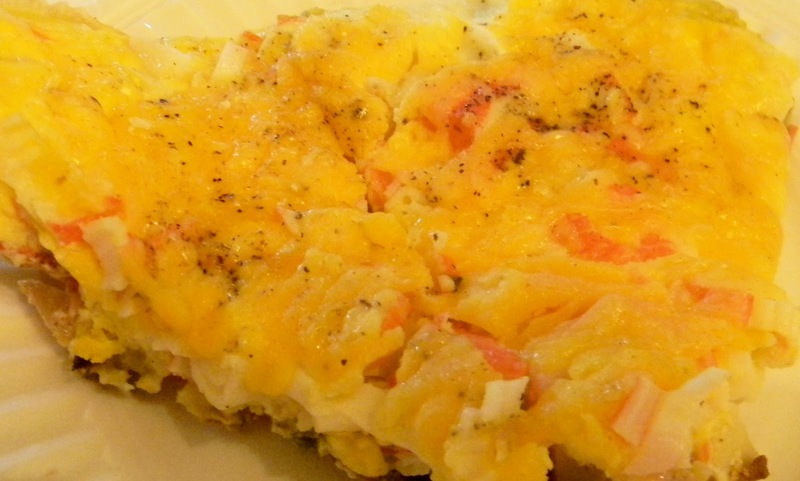 Need a different breakfast style crab and frittata recipe for dinner? Busy moms know that in a last minute dinner time rush—breakfast is what’s for dinner! Most families generally have eggs, bread, and leftover meats and vegetables that are all too easy to throw together as a last minute egg-centered meal. This crab and asparagus frittata recipe uses a few leftovers and comes together in minutes. Instructions for a crab and asparagus frittata. Preheat oven and prepare a skillet. Preheat oven to 350 F. If you will be using a 10-12 inch skillet with a rubber handle—wrap it with foil to protect it when the frittata is finished in the oven. Saute the vegetables. Heat the butter and olive oil in a 10-12 inch skillet until hot—but, not smoking. Add the onions, asparagus, potatoes and peppers to the hot oils and cook until the onion is translucent and the asparagus is crisp-tender. Add the garlic and sauté for a minute more. Create the crab filling. Stir in the cream cheese spread with a rubber spatula until melted and combined with the vegetables. Add the crab meat and stir to coat. Remove from heat. Add the egg and cook on the stovetop. In a small mixing bowl, combine the eggs and milk. Add the egg mixture immediately to the crab filling---taking care to pour all the way around the pan to disperse the egg. Return the frittata pan to medium heat and continue to cook the frittata until the egg is nearly set. Top with cheese and finish baking the frittata. Sprinkle the cheddar cheese over the frittata and set the skillet into the preheated over for 8-10 minutes or until the egg is completely set.